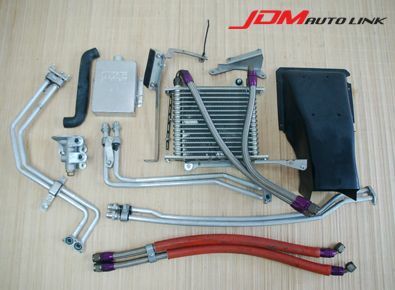 Set of pre-owned HKS Dual Clutch Transmission Cooler Kit for the Nissan GT-R (R35). 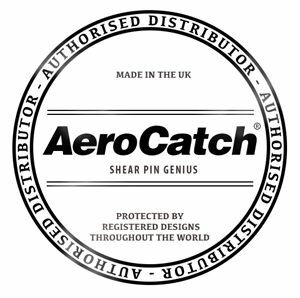 The DCT Cooler Kit has been developed to provide firm, positive shift engagement while assisting in the prevention of overheating the clutch and transmission. By stabilizing and maintaining lower oil temperatures in the transmission, the life cycle of the oil is extended. 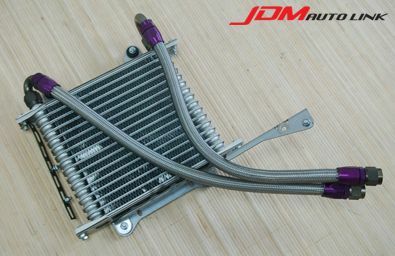 Integrated with the factory water-cooled transmission cooler, the DCT Cooler Kit also assists in reducing the GT-R’s overall water temperature. 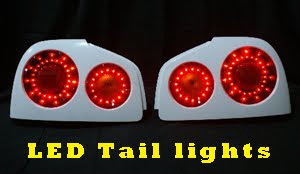 - Placement of the DCT cooler core to the front left fender maximizes cooling efficiency. 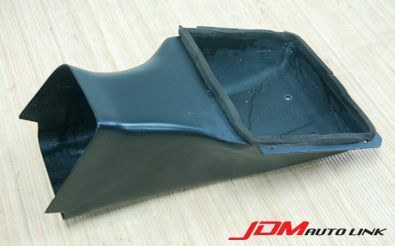 - The included, specially designed, Fiber Reinforced Polymer (FRP) air duct is used to enhance air flow to the core. - A larger -10 size oil line reduces resistance and increases flow ensuring proper oil supply. 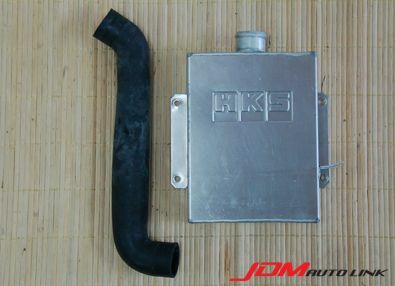 - The transmission’s stock heat exchanger and HKS thermostat are integrated into the DCT Cooler. With a specially designed oil outlet attachment, stabilizing the oil temperature occurs in a shorter amount of time. Improved shifts are noticeable even after cold starts. - During testing at Fuji Speedway, the water temperature was reduced by an average of 5°C (41°F) enabling continuous laps at a constant oil temperature of 127°C (260°F). - Fail safe mode –transmission oil temperatures of 140-145°C (284°-293°F). - Nissan specifies that the oil needs to be replaced immediately once oil temperatures exceed 140°C (284°F). 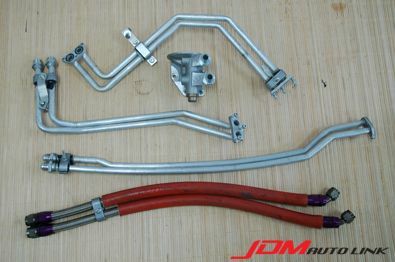 Should you be interested in this part, contact us at sales@jdmautolink.net for more details on pricing and delivery.